It was one of those day's, I found myself on my lonesome. My wife and daughter were off to a party. I was at a loose end so to speak for a few hours. It had been a couple of weeks since I had stretched my legs properly and I felt like a walk. The weather forecast was fine, cloudy with sunshine, no rain. The eternal question though, where to go? Not to far but not to close either. Then the Cairn Table springs to mind. It's been awhile since I walked up there, I had walked pasted it only a few weeks earlier. Done deal. That was that settled, Muirkirk was the heading. Destination decided, I got my walking trousers on, no need to pack the bag everything is in the boot of the car. I just stopped off at the Gregg's in the village and collected some lunch for the walk. A Bottle of IRN BRU, sausage roll and a ham salad baguette. I was off, East Kilbride, Chapleton, Strathaven, Dungavel and then to Muirkirk. The A726 then onto the B743. East Ayrshire really need to get their end of the road sorted. Once your past Glengavel Reservoir and onto Blood Moss, the road is a rutted, pot holed mess but it's such a fun road to drive. Especially as the B743 can be a quiet stretch of road. 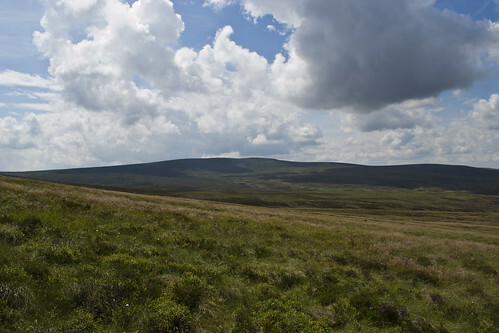 I made Muirkirk in good time and headed for Kames and the walkers' car park. I parked up, only one other car there. Be interesting to see if I would meet anyone, there's about few walks you can do from here and they are all marked on the confusing information board. I got out the car and retrieved my rucksack and Roclites from the boot. 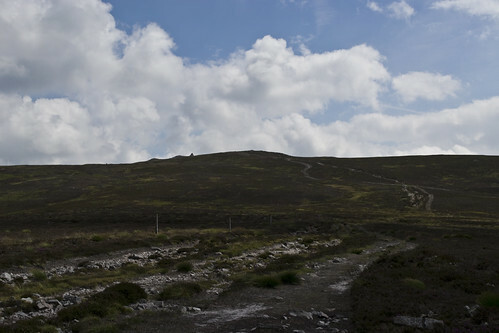 Loaded my lunch into the pack, put on my 315s, grabbed my camera and headed on up the path from the car park and taking the route for the Cairn Table. Straight to the top. The direct path. The path starts by weaving between what is left of Kames's industrial heritage. All lumps and bumps, nondescript, now covered in grass and gorse. There are bits of fence, broken and twisted. Rusted and creaking in the breeze. Crumpled walls of concrete or stone and platforms where buildings, sheds and offices used to sit. The only workers here are the sheep; grazing, baa-ing, wondering if I'm going to feed them. Judging by the landscape it must have been a massive complex. Coal, Iron and Tar works all belching, coughing and smoking at one time or another as well as the quarries mining out the good old red sandstone that Ayrshire was once famous for. To me it's always looked liked this, empty and some what quiet but at some point it must have been full, heaving with men, noisy with the heavy industry. All black, dirty and dusty instead of the lush green grass the yowes are munching on. I confidentially pick my way across this landscape, the path is well worn and easy to follow despite a lot of the markers missing, broken or just so weather worn and ruined that they now look a part of what was here before. It's not long before you have cleared the old works and are out onto the moss and the start of the climb onto The Steel. 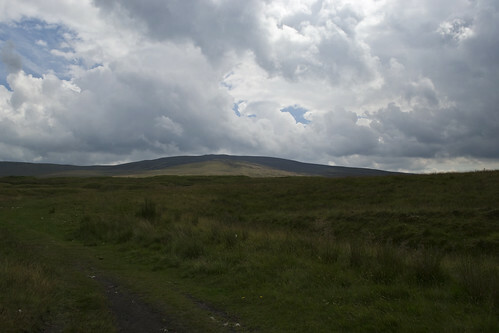 Before you start to climb you zig and zag through the moor. The path here is wedged but not tightly between the Auldhouse burn on one side and the Linky and Cout burns on the other. Following the March fence, suggesting that it's a very old boundary. You cross numerous pols and springs that serve to fill these little streams before they gather speed and join the River Ayr. The most famous is here on the western side, the Cauldron. Where the ancient Picts brewed some sort of get pished quick rocket fuel from the heather, so the legend has it. It can be very boggy underfoot and even more so after some heavy rain. However recently; in the last few years, in association with Scottish Coal, the local community have placed wooden paths at strategic points to save you getting your feet too wet. Making the access easy and not at all that heavy but still care is needed. Looking up the climb to the top of The Steel; I'm not sure where it gets it's name from or what it is a corruption of, I first noticed a dog then a couple of walkers making their way down. It's always nice to see others out. Like I'm always saying it's a rare thing to meet others on these Ayrshire hills. It was then I could feel the wind get up a bit and the temperature drop. Not much but still noticeable. The clouds were blowing from the south and they were looking dark and angry, so much for the weather forecast. It looked like a shower of rain was on its way. Once your out, your out. I was contemplating digging the jacket out the bag when the dog appeared in front of me and stopped. I crossed one of the wooden sections towards it, as his owners came down. Hello's were exchanged and we chatted about the local hills. They were also on a short timescale, having driven down from Ayr, they had to be back for early afternoon. 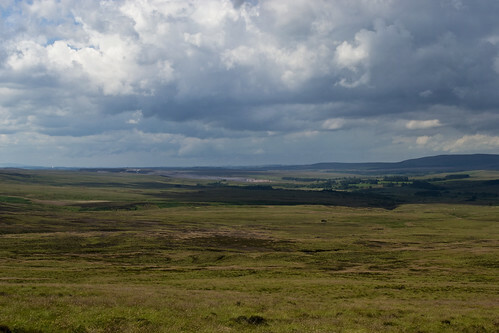 I pointed them to Blackcraig at New Cumnock and the hills around the dam next time if they were looking for more hills that were close to them. They usually drove down towards Galloway and walked around Carsphairn. I place I know nearly as well. They hadn't as I had wondered on seeing them up on the Steel; done the circular route for the Cairn Table, like I was going to do but in reverse. I had thought that they had started at the car park and headed along the old Sanquhar road, then heading to the summit and down this path but no. They had gone straight up and were heading back to their car. It was then we all felt a spot of rain. Just a little one. It was water none-the-less. We said our goodbyes and I started my climb. Luckily the water came to nothing, blown away with the wind. It had picked even more. That being an understatement. I wasn't cold though just windy. Summertime. I continued up the path which is now a big scar on the hill. You don't have worry about getting lost the track is very obvious and wide. Weathered sandstone like the mountains bones juts out through the soil like an open fracture. It's not entirely due to natural erosion but a combination of walkers, fell runners and MTBers exposing it and the rains washing the dirt away. A little bit of everything is to blame, only a thin skin covering the rocks makes it easy to wear. There was also some obvious signs of scramblers being on the hillside. Deep ruts gouged by the powerful engines of the motorcycles. Not sure how you go about fixing it and it's not just confined to the Cairn Table almost all un-managed hills have the problem. I supposed it's the problem that comes with the right of access and those that are less responsible? Who knows, I don't. I continued on up the 3 lane motorway that is the path and noticed my second pair of walkers with a dog, locals. How did I know they were local? Did I recognise them? No. They were in jogging suits and trainers. You don't get much more local than that. That would cause a bit of an uproar in certain circles, still it won't be the strangest or the craziest thing I've seen on a hill. However I have a feeling the pair know this place better than I do. We spoke, the usual hello, the rain seems to have missed us, luckily and such like in the local parlance ken? They headed down, I headed on up towards the top. 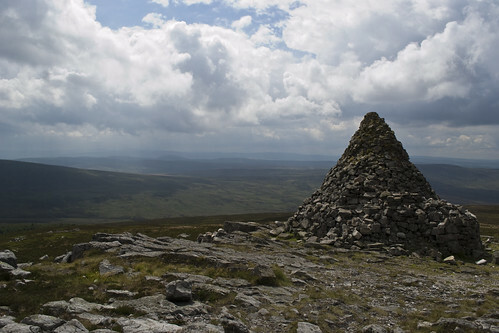 It's an impressive sight when the summit cairn rears into full view. For a long time you're only seeing the tip of it. It's a fitting monument. There were two but now there are three cairns on the Cairn Table. Two you don't see from a distance; both ancient, now collapsed. The other; a massive monument, pyramidal. A memorial to those in the Great War that didn't return and those that did. Built from the stones already on the summit, hence two became three. Story goes that the two original cairns cover the bones of some centuries old mystical Druids. Sounds great, Picts and Druids invoking the spirits. 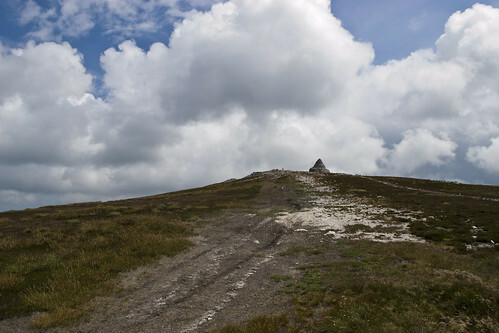 The massive cairn loomed up as I got closer to the summit dwarfing the little trig pillar and the information pillar. It wasn't the only thing that loomed up though, the wind was blowing at a good rate of knots being on the summit. Strong enough that it was chilling me, now that I had stopped walking. The legs no longer pumping. I got into the lea of the monument and out of the wind, retrieving my jacket from my pack. The war memorial has a plaque, "ERECTED IN MEMORY OF THE 87 MEN OF MUIRKIRK PARISH WHO FELL IN, AND ALSO TO THE HONOUR OF THE 262 MEN AND WOMEN WHO RETURNED FROM, THE GREAT WAR 1914-1918" a poignant reminder, along with the remains of poppy wreathes flopping at the base in the wind from the Armistice Day remembrance services that take place here. All zipped up and insulated from the wind and this is was meant to be the summer. I had the top all to myself. I started wandering around the cairns and the pillars. Despite the wind and the cloud, I had a great view. 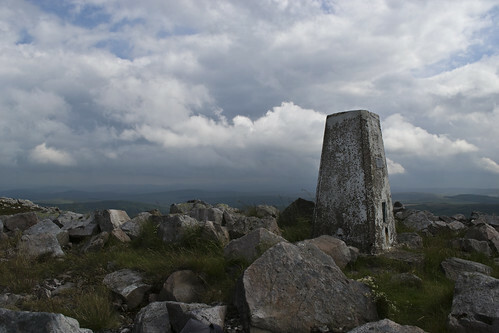 I've stood on that very spot and could see all the way to Jura and her Paps. 80 odd miles as the crow flies but not today and not that it's mentioned on the information pillar. However the view was still spectacular. I could see Arran in the distance, Goatfelll clearing the cloud to my west and over to the east I could see Tinto hill majestic, proud. 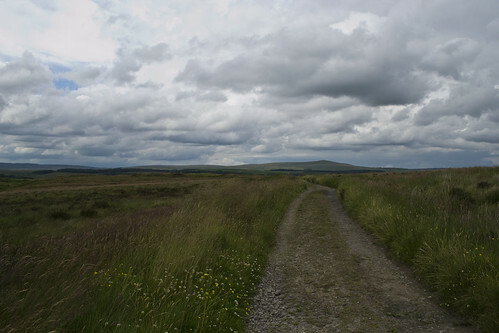 Away to the south was the Lowther Hills and to the south and west, Blackcraig, the Galloway hills beyond. 360 clear panorama. I could make out the coast and the heads of Ayr. I could see the places of Ayrshire dotted in the landscape. I could also see many wind farms and worst of all the massive holes of open-casts. I could hear my lunch calling from my rucksack, it was that or my belly rumbling but I ignored it a little longer and got on with taking some photographs. For some reason I got the idea of trying to take a photo of myself. I'd been impressed of late at how a group of tweeters and walkers including @Petesy, @Astronick, @hendrikmorkel and @stewyphoto managed them so well. Making it look easy. It isn't easy, I fannied about for ages. My stomach growing more and more annoyed with me and the lack of food it was receiving. Finally after many attempts, I got one that I was kind of happy with. Lucky it's a digital camera. Delete, delete, delete, mibbay, delete, mibbay, delete, delete. 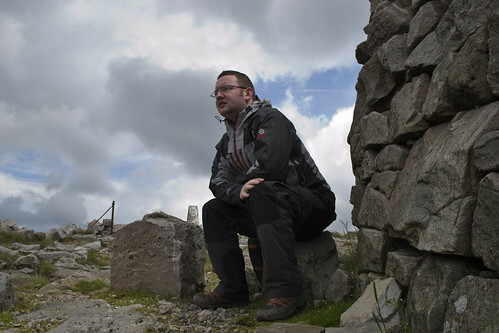 That over with, I hunkered down at the base of the cairn. Sheltered, looking towards Ayr and Arran. Kicked backed I enjoyed a good lunch. Eating finished, I packed up my rubbish and got my rucksack set on my shoulders, starting off down hill but not by the track I took on the upward journey. I was making down towards the old Sanquhar road to where it crosses the Garpel burn. If I thought the path on the other side was in bad condition then this was worse. The motor bikes are really ripping up the heather and peat on this slope. Huge ankle breaking holes. I skip my way down dodging the ruts, picking up the old road with ease. Tarmacadam's first all the way from Muirkirk to Sanquhar. I'm heading to Muirkirk, back to Kames to the car. Easy walking now I'm on a hard packed surface my pace increasing with almost every step. It's not long before I'm passed Macadam's Cairn and passing the ruins of his house at Springhill. Next stop is the car and home.